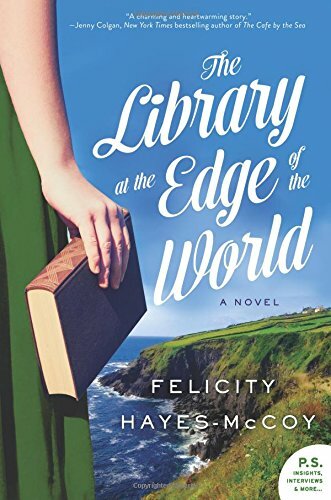 Life can seem to be a bit of a slog once you’ve been disappointed, but Hanna Casey, heroine of Felicity Hayes-McCoy’s latest U.S. release, The Library at the End of the World, is about to find out that lightness and connection are still possible. Following the dissolution of her decades-long marriage, Hanna, child in tow, fled her house in London for her mother’s home in Ireland. Four years later, her daughter is grown and on her own, but Hanna feels stuck in her job, unhappy at home, and increasingly isolated. The chance recollection of a house inherited from her great aunt when Hanna was a child opens new doors for the lonely librarian; a dodgy business deal that threatens the welfare of the small Irish peninsula’s villages and Hanna’s personal well-being smashes those doors down. Hayes-McCoy has imagined a gentle, spirited community on the Irish coast, one along the lines of many of Maeve Binchy’s villages or Jan Karon’s Mitford novels. Hanna is an interesting character presented in an evocative manner. When seen though her own eyes, the reader is presented with a hesitant, insecure woman, one who is tired to her bones. Hanna seen through the eyes of her neighbors and coworkers is a different person altogether, one who is brusque, no-nonsense, and decided. Hayes-McCoy pulls off an unusual feat in making Hanna’s dual nature understandable and believable. This is a decidedly character driven novel, again along the lines of Binchy and Karon. Though there is a storyline (the villages of the peninsula rallying to save themselves from government depredations), there are many offshoot stories, meant to showcase the tempers and temperaments of the varying members of Hanna’s society. The refurbishment of Hanna’s house by the fiery Fury O’Shea, Conor’s troubles with his farm and ailing father, Hanna’s mother Mary’s temper, the state of the village elderly and the businesses they frequent—these are all as important in the eyes of Hayes-McCoy as the BIG problem in town. For the reader looking for a slice of small town gossip and real life personalities, The Library at the Edge of the World could be a breath of fresh air in a literary world full of novels striving to cover the next “serious” issue, or to shock and awe their readers. Readers who shun books that take their time to ask and answer the small questions of life will likely have a difficult time getting into this novel. The Library at the Edge of the World is no world burner, and it will not shock readers. What it will do, for the right reader, will be to make them smile. It offers reassurance that the best in people is usually not buried very deep and that community is important. Family is important. And if the denouement arrives dressed like an Irish fairy tale, so be it. This is a gentle novel, the literary equivalent of warm slippers and a cup of tea by the fire. And there is absolutely nothing wrong with that.